If Britney Spears, Robert De Niro, and Jay-Z could try their hands at running a New York City restaurant, then why not Al Lewis, aka Grandpa Munster? From 1987 to 1993, you could find the tall, affable Lewis—once a basketball star at Thomas Jefferson High School in East New York—in the restaurant he opened on Bleecker and Leroy Streets, Grampa’s Bella Gente Italian. There he played up the whole Munsters thing, letting diners and passersby on the corner address him as grandpa. After Grampa’s closed, he didn’t cease being a local celebrity. Lewis hosted a political talk show on WBAI in the 1990s. He even ran for governor in 1998 on the Green Party ticket (and scored 52,000 votes). He died at age 82 in his home on Roosevelt Island. This entry was posted on January 2, 2012 at 3:52 am and is filed under Bars and restaurants, Brooklyn, Music, art, theater, Old print ads, Politics, West Village. You can follow any responses to this entry through the RSS 2.0 feed. You can leave a response, or trackback from your own site. Great link, thanks! Yeah, it’s hard to know what was true and what was part of his shtick as an actor. But he was definitely a New York character. 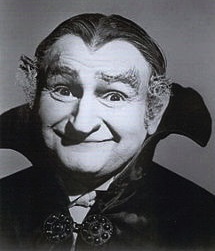 Went there several times in my younger days and got a kick out of seeing Grandpa Munster. Thanks for the post! There is a playground on Roosevelt Island named for Al Lewis. I bet Butch Patrick doesn’t have a playground named for him! He used to stand out in front of the restaurant on the sidewalk, and greet folks, beckon them in, and pose for photos. Real City Character, and that’s my hightest compliment. I ate there once with a bunch of friends, and Grandpa Al posed with us for a few photos. The food was okay but we went for the atmosphere. What’s up with the Grampa/Grandpa dichotomy? 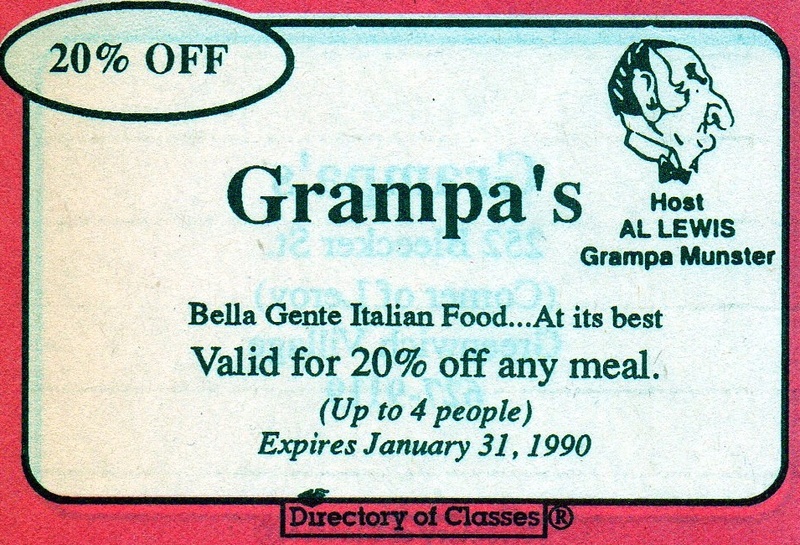 Most references to his show character call him Grandpa, but he named his restaurant the more colloquial Grampa. I saw him once standing outside the restaurant with his cape. Always loved the Munsters and had a postcard from Grampas restaurant but never got to go there. We loved him when he was on Howard Sterns television show in the 90s. RIP. Don’t forget about him in Car 54.